The two subjects of Saint Ex are author and World War II pilot Antoine de Saint-Exupery, best known for his book The Little Prince; and his wife (later widow) Consuelo Suncin de Sandoval. I suppose it might add to your engagement in the piece if you knew a little about these two people before you came to the theater, but I don’t think it’s necessary to enjoy Saint Ex. Part of the development of the piece will be decisions about just how much more (or less) the creators want to lean on the real life details of the lives of this pair, and how salient they are to the point of Saint Ex. What is the point of Saint Ex? What questions is it trying to raise and explore? What answers, if any, is it trying to offer? Why these two people? Why this point in their lives? These are the things I’m still puzzling over after watching Saint Ex. How clear a notion they want me to take away, how direct or indirect an impact they want the piece to have on me, that’s still something about which I’m a little fuzzy. Nathan Gebhard’s dance and performance, under Jeesun Choi’s director, is mesmerizing, at times almost hypnotic. We begin and end with a man drowning at sea after a plane crash. We alternate in the time between seeing both him, and his wife, with Gebhard assuming both roles. When first establishing the wife, Gebhard dons a pair of high heels. He returns to the heels at times but once the character is set in our minds, it’s less necessary. The change in attitude, in light, in movement, is enough to let us know who’s who. The movement between personalities is never confusing. There are some beautiful visuals - the way the man struggles and then even seems to dance or fly in his trenchcoat; the way the woman lays out bed linens to help the florists save beds of roses from an overnight frost, and how those linens, white and red, are later twisted up into rose-like bundles. It’s a little hard to know how the journeys of the man and the woman connect or even intersect. They are bound by love and marriage. But the preoccupations on his side of the narrative seem to be exclusively about adventure, risk, and war. And her discussions are largely focused on who she is, in relation to him and to his artistic work. She has supported both, and yet she feels she can lay no claim to either. Who is she, apart from and without them? The man has cheated death before, but eventually everyone’s luck runs out, and the world is a dangerous place. Yet she is insulated from all this, as if they quite literally lived in two different worlds. Still, they shared one, at some point. They don’t here. And we have only the woman’s word for the man’s artistic endeavors. They don’t surface on his side of the narrative (physical or verbal) at all. Why are these two characters in a piece together? What two sides of a larger issue do they unfold? Are they two completely separate lives, or do they add up to something more together? It feels like the piece might be taking the facts of real life for granted, justifying the piece from the outside, rather than existing as a foundation within the piece itself. If she is his muse and not merely his support system, how is that made manifest? The show description for Saint Ex describes it as a physical poem. While I enjoy poetry, breaking down poetry (like explaining a joke), kind of defeats the purpose. Perhaps being simply carried along by the compelling visuals of Saint Ex, and letting the words float by like a kind of music, should be enough. 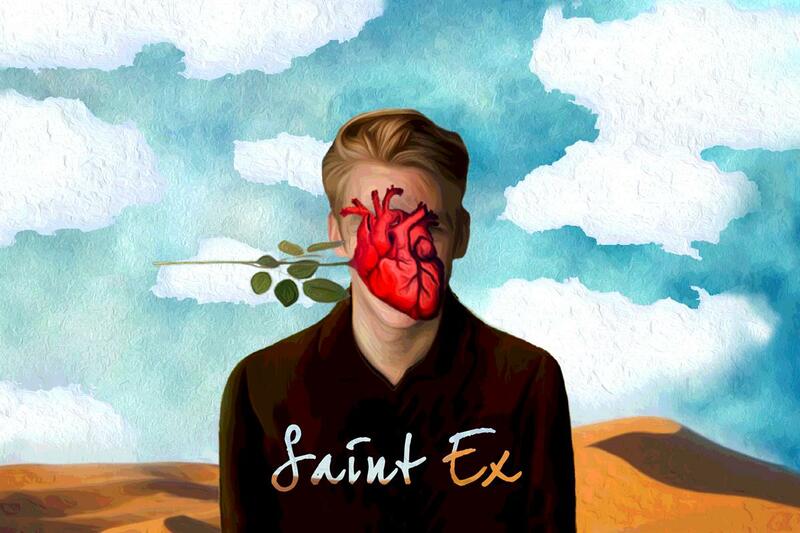 I just feel like Saint Ex is reaching for something a little more than that, and I’m not entirely sure what it is. That said, Saint Ex is one of the more intriguing pieces of physical theater I’ve seen so far at the Fringe this year. You should check it out for yourself. Here's some handy links to reviews of 5 Star Shows, 4.5 Star Shows, 4 Star Shows, 3 Star Shows, and my full Top 10, Top 11-20 and Returning Favorites lists.